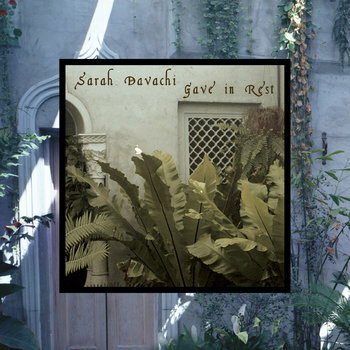 Between January and September of 2017, Sarah Davachi lived in flux; storing her belongings in Vancouver, she spent the summer in Europe, occasionally performing in churches and lapidariums and seeking respite from her transitional state while surrounded by such storied history. Gave In Rest echoes that emotional state of solitude and ephemerality, reaching towards familiar musical landscapes but from oblique perspectives. "I've always been a pretty solitary person, but that summer I discovered quiet moments to be increasingly valuable," says Davachi. "I became engaged in private practices of rest and rumination, almost to the point of ritual." Though not religious, she sought ecclesiastic environments, compelled by "the quietude, the air of reverence, the openness of the physical space, the stillness of the altars." She sat for hours in muted spaces and listened to how church instruments augmented them – their pipe organs, their bells, their choral voices – and resolved to, "tap into that way of listening." She set a goal to musically embody this secular mysticism, and Gave In Rest is the result. Out September 14th, 2018. More information can be found here and here.